Sarah Ann and the Star - 2 Sizes! Sarah Ann is taking a moment out of her busy holiday season to contemplate the true meaning of Christmas...let's join her! I am so blessed with this refined and gentle artwork by Julia Baez ...it was pure joy to digitize, and of course I added in a few touches of my own to personalize it. You will receive both designs in one set as this will give you so many more options in your holiday decorating. Try them on dark navy colored fabric...they really stand out that way. They would be appreciated on quilts or wall hangings, pillow tops, sweatshirts, towels, potholders, and or simply displayed in a picture frame. Sarah Ann is taking a moment out of her busy holiday season to contemplate the true meaning of Christmas...let's join her! I am so blessed with this refined and gentle artwork by Julia Baez ...it was pure joy to digitize, and of course I added in a few touches of my own to personalize it. You will receive both designs in one set as this will give you so many more options in your holiday decorating. Try them on dark navy colored fabric...they really stand out that way. 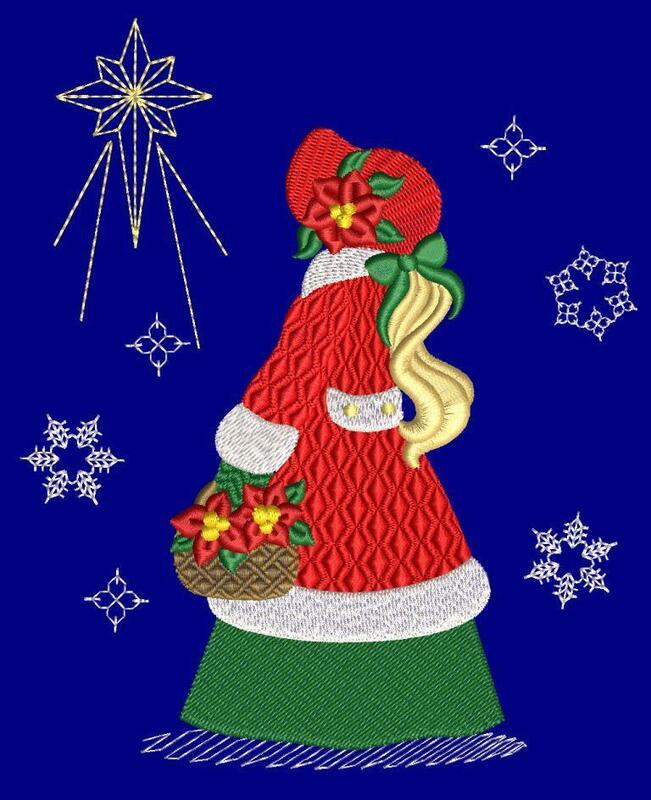 They would be appreciated on quilts or wall hangings, pillow tops, sweatshirts, towels, potholders, and or simply displayed in a picture frame. Finish Size 5.36" x 6.55"
Finish Size 5.80" x 8.33"